Peters Siddle has given up meat but that hasn't stopped his blood-lust. With complete disregard for the unwritten warning about what will happen if you bounce a fellow quicky, he banged one in short from around the wicket to Dale Steyn. It was aimed at the body but Steyn couldn't get away in time and had to duck awkwardly. He was caught on the glove and then struck high on the arm as the ball looped high over Matthew Wade. No doubt Steyn would have noted that for future use. Hashim Amla was thinking about reviewing his lbw decision and even chatted to Jacques Kallis about it before walking off. Had he asked for it, he would have batted on because Peter Siddle's delivery hit him too high, as replays later showed. When Dale Steyn was given out lbw to Ben Hilfenhaus off Asad Rauf, he did not make the same mistake. Steyn asked for the review immediately and was correct in doing so. Again, it was too high and Steyn batted on. One of the most interesting side-shows in Australian cricket are the beach-ball games that take place in the stands. A blue-and-white ball made its appearance at the Stanley Street end and helped entertain the crowd while South Africa crept along. Michael Hussey, who was fielding at third man, got involved too and kicked the ball over the boundary twice. He wasn't in place on the third occasion and the ball was taken away by security amid a chorus of boos. It was hard not to feel for Nathan Lyon late in the South African innings, when in his 25th consecutive over - a spell from the Stanley Street End that started before lunch and finished after tea - he should have claimed his third wicket of the innings. Rory Kleinveldt skied a miscued slog and Ed Cowan at midwicket tried to position himself under the ball, but whether it was a swirling breeze or the glare of the sun, he started staggering around like a drunk as he struggled to judge the catch. Cowan never really looked like taking the ball and it bounced out of his hands and denied Lyon further reward for his monumental spell. After the umpires called for drinks in the first session, the players and officials came together and lined up for a minute's silence. It was 11am on the 11th day of the 11th month - Remembrance Day, recognising the end of World War I on this day in 1918. An Australian Army bugler played The Last Post and for a short period, players and fans from both sides were united. It was a reminder that cricket might be a contest, but it is not a war. Two days ago, Siddle did his Morne Morkel impression and had Kallis caught at mid-off off a no-ball. Today, the real Morne Morkel showed up. With Australia scoring at close to six runs an over towards the end of the day. 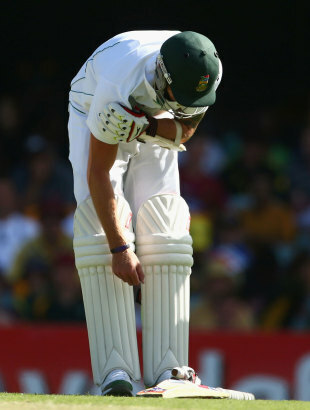 South Africa were searching to stem the flow and make one more break before the end of play. Graeme Smith seemed to ask his three frontliners to throw their all at it at the end. Morkel followed instructions and in his last over, thought he had Cowan caught behind. Asad Rauf didn't budge and Smith reviewed. Replays showed Morkel's foot a fraction over the line and that Cowan had gloved the ball. What should have been a wicket was just another reason to ask why Morkel doesn't take a step back before he runs up.